I love the colouring so much!! Yeah that's fine. Go ahead. 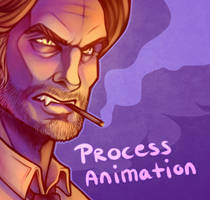 I certainly love Bigby and this picture, you have really done him justice. Well done. There's a badass in the town! oh man, i love Bigby to death. I love this! its so well painted and everything! Love the colours you used in this, looks awesome!! That is so good, damn! I love it! can ´t wait to play the next parts! omg bigby~! I love the style you drew him in! Very well done. I'm so excited for the second episode! I can hardly wait! Thank you! Ah yes, looking forward to it! It's amazing. Mind if I use it as profile image on Steam? Wow this is just amazing I love it. it should be around the bottom of the second page. Hey, that's cool. I don't mind Thanks for adding it. thanks, it's been getting positive feedback so far. Very cool! I love your use of color and your style. Nice work! can I use this as a Youtube thumbnail? I'll put a link in the description. And I love this game! !